I am convinced that my dog and I are genetically linked. I think I wrote about this once before but I can’t find the post and quite honestly it has been a long day. Mel and I both suffer from hypothyroidism. Not all that uncommon in women ‘of a certain age‘, this basically means that we have underactive thyroids that do not produce a certain hormone and can cause us to feel sluggish. There are other more miserable things that it can cause but luckily neither one of us gone that far. As a result of this disorder, I find myself in the odd circumstance to be taking the same medication as my pup. 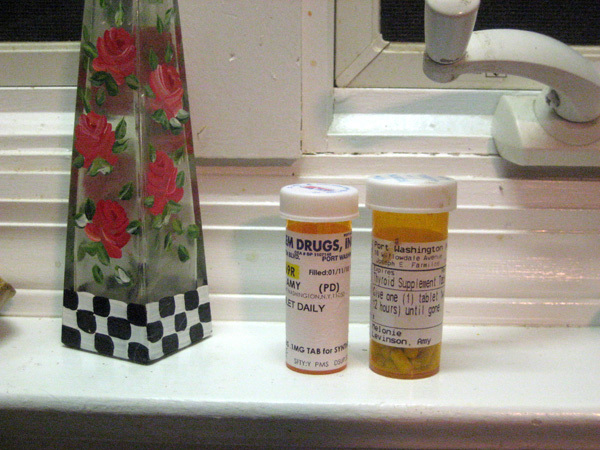 There on the windowsill in the kitchen sit two (almost identical) bottles of pills. One sleepy morning this week I took a pill from my bottle and buried it neatly in a chunk of the wet dog food that I mix in with Mel’s kibble. As I was inserting the pill I noticed it was yellow and not lavender, indicating this was my pill not hers. Now don’t get me wrong here but at the price I pay for meds these days I was not about to throw away a perfectly good pill just because it had a slight slime of dog food on it. Like any self-respecting dog owner would, I wiped it off and put it back in the bottle. So if any of you notice me scratching myself behind my ear with my foot or barking uncontrollably this week you will understand why. Scary, but I think it is true. My dog has not been feeling well lately. She has been panting at odd times and drinking a ton, so I decided it was time to bring her to the vet. Please understand that I love this animal as if she were part of the family. No, I do not walk her in a stroller, I am able to differentiate between my kids and my pet, but I do love her just the same. Keep in mind she just turned 11, so going to the vet to find out what is wrong is a tricky proposition. Nothing worse than dropping 1,000 bucks to find out your dog is terminal. Luckily, she is not. And it only cost $480 to find that out – a bargain. It seems, good ole Mel suffers from hypothyroidism. This would explain her weight gain (not the table scraps I have berated Gary for giving her) and could explain her other symptoms. Oh, and her pH is off (what the hell?). So who else in this house suffers from this plight? You guessed it (and the photo gave it away). So, my friends, my dog and I are now on the same meds! I am praying she does not get rabies!